The econo chute is our best budget friendly option for customers who don’t need our pro squeeze chute. Since this chute uses the same materials as our other equipment, the quality is great. In fact, it features the same floor as in our other chutes. Another great feature is the drop gate at the rear of this chute. 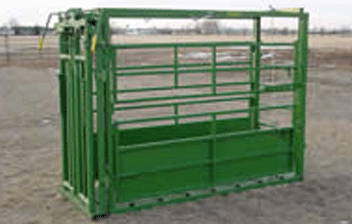 Above all, our customers see the value of adding this piece to their ranch. In conclusion, the econo chute will get the job done all while saving you money! Dimensions: 8.5′ x 36″ 1100 lbs. Can be d with or without automatic spring-loaded headgate.